Back in March I blogged about the striking similarities between an entrepreneur who is trying to bring technology to market and a writer who is attempting to publish a novel. I referenced the fact that I would soon be attending a literary conference, Ad Astra, as part of my business development and self-improvement efforts. Ad Astra was in fact this past weekend and it is timely to write about the lessons learned from that experience in light of Alex’s post yesterday about the value of face-to-face contact in the age of social media. Writers, like engineers, programmers and other creative types, often toil away in seclusion. We think we are staying in touch with the world, and the industries or markets in which we hope to sell our products, by using those ubiquitous social media tools. We can follow and contribute to Twitter streams, discussion threads, post comments on walls and read curated newsfeeds. But this is still akin to drifting over the landscape in a hot air balloon and shouting down at the masses below “how’s it going?” when what you really need to do is drop anchor and go see for yourself. Attending local networking and industry events can only take you so far. It is the nature of such events to be limited to the local community, to the peers, support and resources with which you are already familiar. But if your intent is to bring your product to markets outside of your own backyard, this is likely not exposing you to the full range of resources and insight you need to do so successfully. Which brings us back to Ad Astra, or, more appropriately, industry conferences in general, which provide that valuable opportunity to get face time with influencers, investors and potential partners from a variety of geographies and backgrounds. This was my third time at a literary conference and it became quite evident that there is an incremental and cumulative benefit from the effort. In many instances, I was engaging with specific authors and publishers for the third time. I am becoming a familiar face. In a few short hours, I strengthened relationships in a way that I never could, and haven’t, by relying on social media alone. Authors, publishers and agents, like seasoned entrepreneurs, successful executives and big name investors, all have their followings as well as their inner circle entourages. In both instances, sitting back and letting your fingers do all the talking through social media is likely to leave you lost among the great unwashed masses. If you want to be more than follower #1,358 in someone’s Twitter stream, you need to put yourself in front of them. But with any effort to build a professional relationship through networking, you have to be respectful of their time. 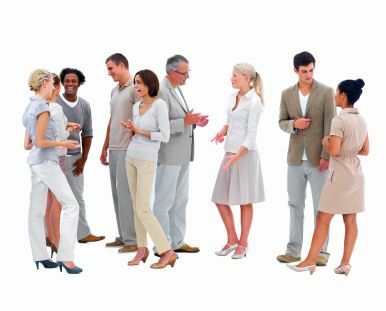 You also need to treat the other individual as a person and chat them up a bit – have your elevator pitch ready, but don’t breathlessly blurt it out as soon as you make eye contact. And while a strong pitch is key (and a subject for another time) don’t worry if it isn’t poem perfect and you trip over your tongue. It’s better for your passion to shine through than to come across like a slick used car salesman. Have realistic expectations about who you should talk to and how the six degrees of separation can come into play. This is an opportunity to expand your peer group as well as forge relationships with individuals who can open other doors for you. Don’t forget that, while you are looking for people who can provide some measure of value, you should also be looking for ways that you can reciprocate. Most importantly, if you are serious about your business and getting that ____________ to market, this is a commitment of time, effort and money that you must be willing to make. It may not be feasible to head to a conference once a month, but, regardless of your market segment, there are no doubt a couple of events a year that can give you bang for your buck. You just have to do your research ahead of time to know whose path you would like to cross.